A multicolored and bright border of flowers is stunning. I admit I love the purple second border as well. 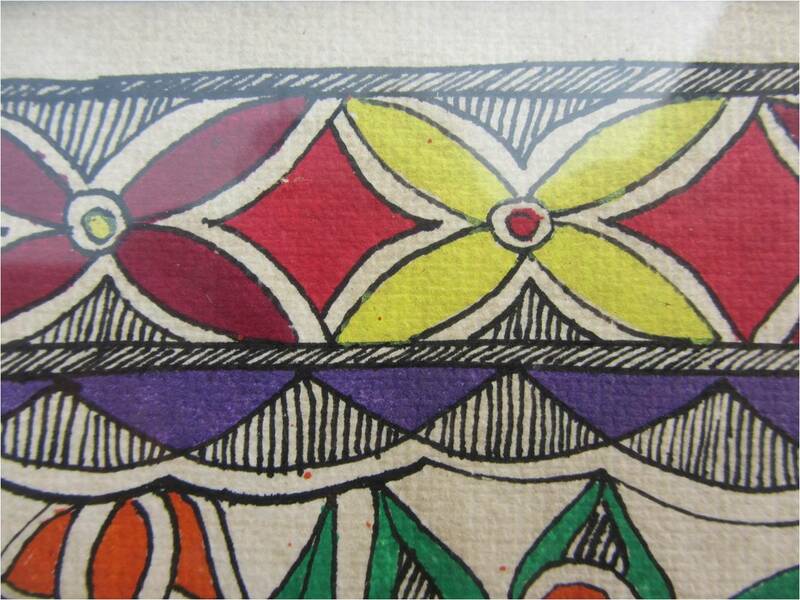 Purple is not common in Madhubani paintings, so it gives a contrasting feel to the painting. I have used myself this border and the color scheme on my "Shiva-Parvati" painting. 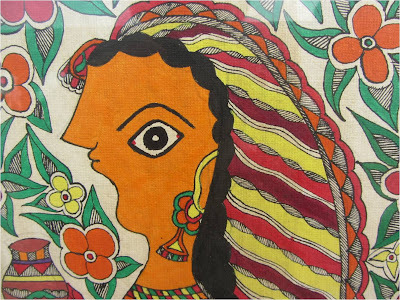 In this painting Radha's face is pretty funny without the forehead, however it stays cute. 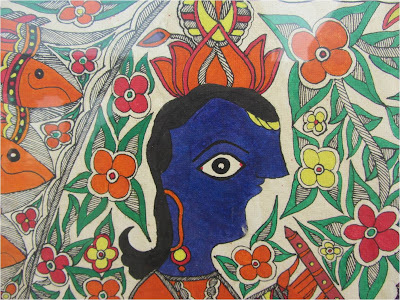 Krishna's face, like Radha's looks pretty weird in this painting as well, his complexion is dark blue and there is no big contrast between the hairline and the skin. In any case this one is one cute Krishna for sure! 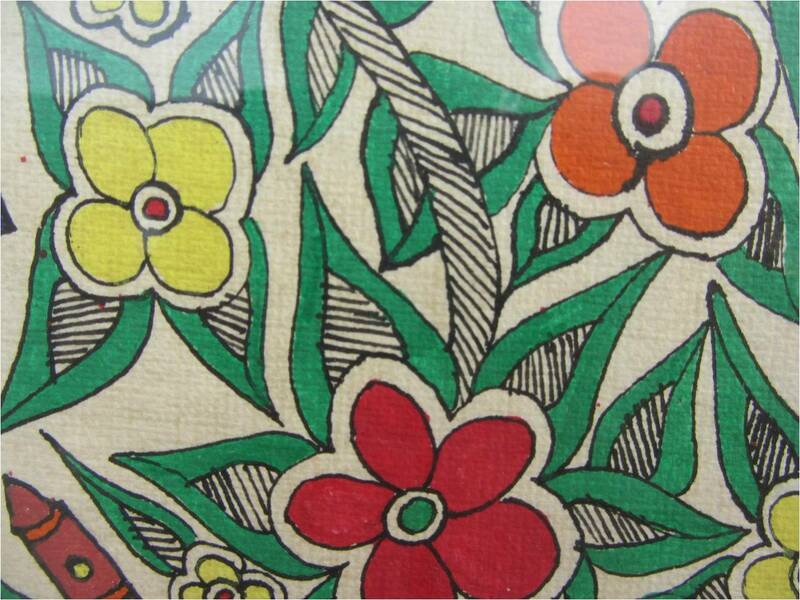 If you think you can't make Madhubani human faces (or even a fish), you can always draw flowers. Many of them! 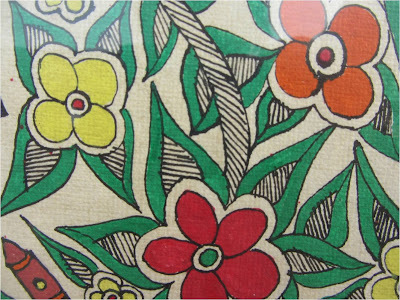 This is the perfect example of how to draw Madhubani flowers. These are two photos. 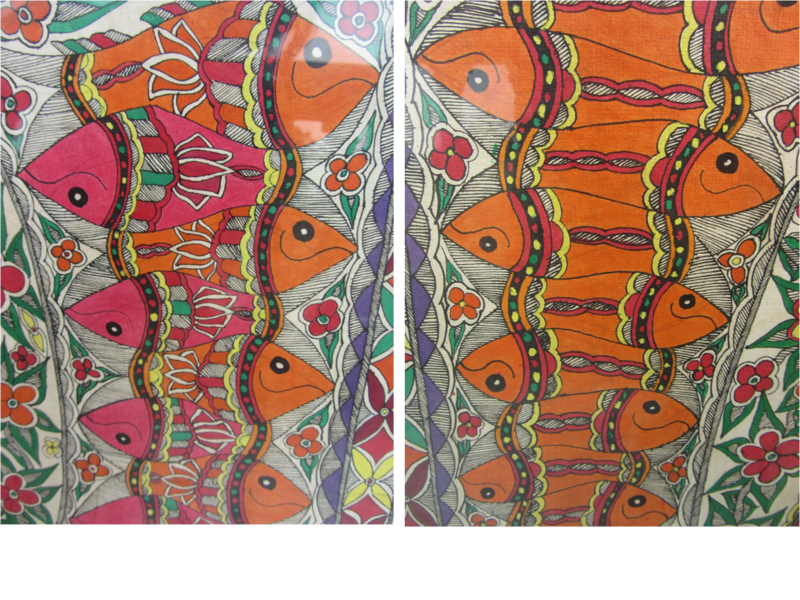 One is the fishe on the right and the other one - the fish on the left of the painting. 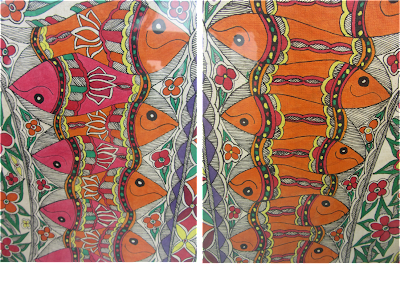 On one side some fish are actually pinkish red which doesn't seem to follow a sensible way of doing folk art where everything is supposed to be repetitive. 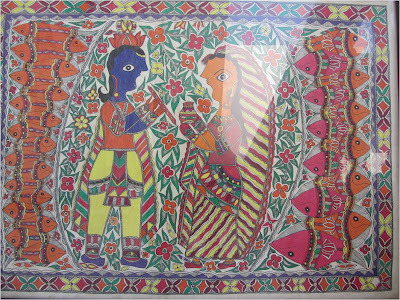 I love this about Madhubani: mistakes or surprises? 7. Matka - a cup. 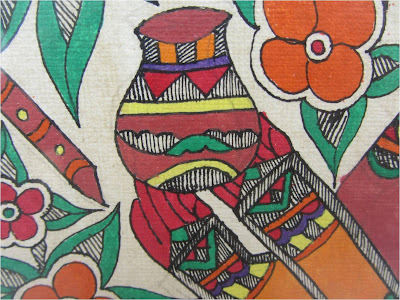 Matka is something made of clay, like a pot or vase to store the water and the "matka" or cup that Radha holds is really pretty. 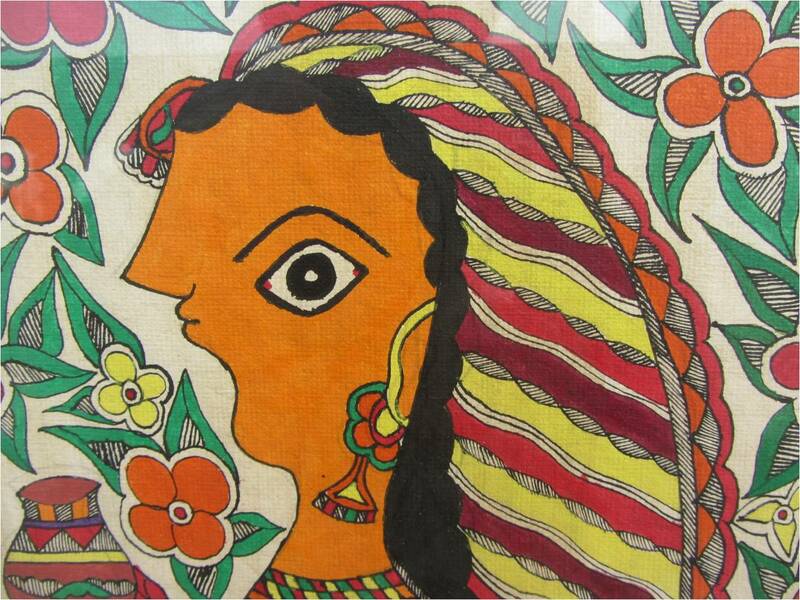 You can make a painting of a matka, surrounded by a beautiful Madhubani border! 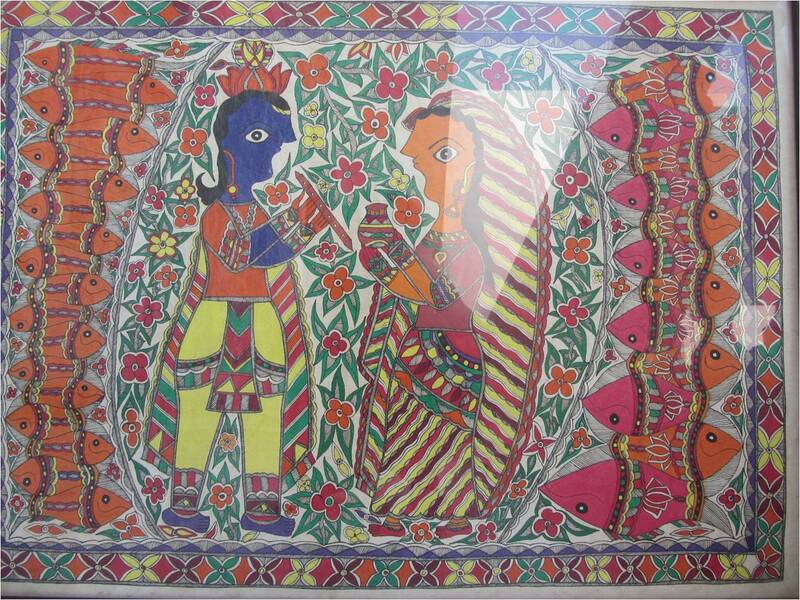 This was the end of my post on the two "Radha-Krisha" paintings that I own.